This tropical, lush and scarcely developed little island is actually two islands; joined by a bridge. Huahine Nui (big Huahine), to the north, and Huahine Iti (Little huahine) to the south. Huahine Nui is home to the bustling little village of Fare, with most of the tourist and administrative facilities, including a brilliantly stocked supermarket, bank, gift shops, restaurants, medical clinic and pharmacy. The village of Fare is a sleepy little south-seas port where you will feel as though you have stepped back in time, although you may be pleasantly surprised to find much more than you expected. We had anchored in Haavai bay and taken the dinghy ashore to arrange to rent a car. The Avis car hire was just a few minutes walk from the dock. A small building alongside one of the two the local gas stations in Fare and I think on the island. The lovely lady, who ran the office, was so friendly and helpful, (Avis should send their staff here to learn something about customer service). We arranged to pick the car up at 8am the following morning and then did a quick shop in the supermarket. We were completely taken aback by the size of the store and the supplies available. Normally on an isolated little island like this there would only be a small store with very limited provisions, and little to no fresh produce. The supermarket here offers everything and then some! The following morning we packed cameras, beachwear, towels, drinks, suntan lotion etc, etc, etc and off we set. We headed out from Fare on the one road around the island. 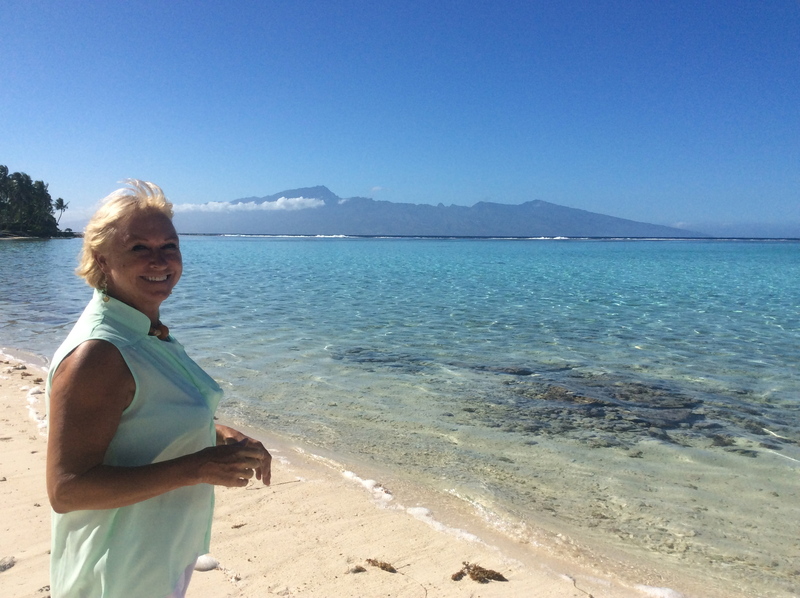 Our first stop was at a palm fringed, long white sand beach, with Incredible views out over the lagoon, to the breathtaking mountains on the island of Raiatea. The azure blue water looked so tempting, it was hard to resist grabbing our swim wear and just diving in, but we were keen to continue our drive and see as much of the island as we could. We walked a little along the beach and took some photographs before continuing our exploration of the Island. Next we arrived at a “marae” which is the stone monuments remaining from the sites where the early Polynesian Spiritual Leaders and Chieftains established themselves and their tribal settlements. The ancient site had been immaculately restored with a large ‘Fare Potee’, a replica of an open traditional house built on the site and used as a museum. It was cool inside as we walked around viewing the ancient artefacts and reading about the fascinating history of the site and the island. When Bob was in Huahini three years ago on the world rally with Ed, they had discovered a lovely beach for snorkelling next to a hotel on the north end of the island. While we were driving around (off the beaten track) the little sand roads searching for an art gallery that I had heard about, we accidently came across the secluded beach. The hotel was closed and appeared sadly abandoned; it was such a shame to see it neglected and overgrown, in what was such an idyllic location; the beach was spectacular, but it was well hidden, probably too big of an Island secret to attract enough guests to keep it as a going concern. 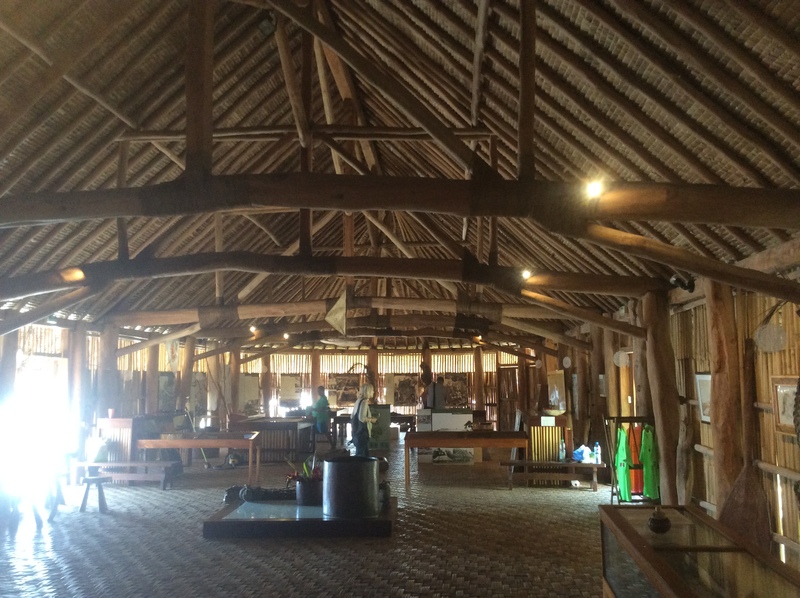 We eventually found the art gallery, a little thatched hut that boasted a studio and gallery in one. The artist showed us some of her beautiful work, all her work was of local people and places. I was sorely tempted to buy something; sadly we have no available wall space aboard for hanging paintings. I picked up three fabulous small paintings of local dancers, but with nowhere to hang them I had to resist. 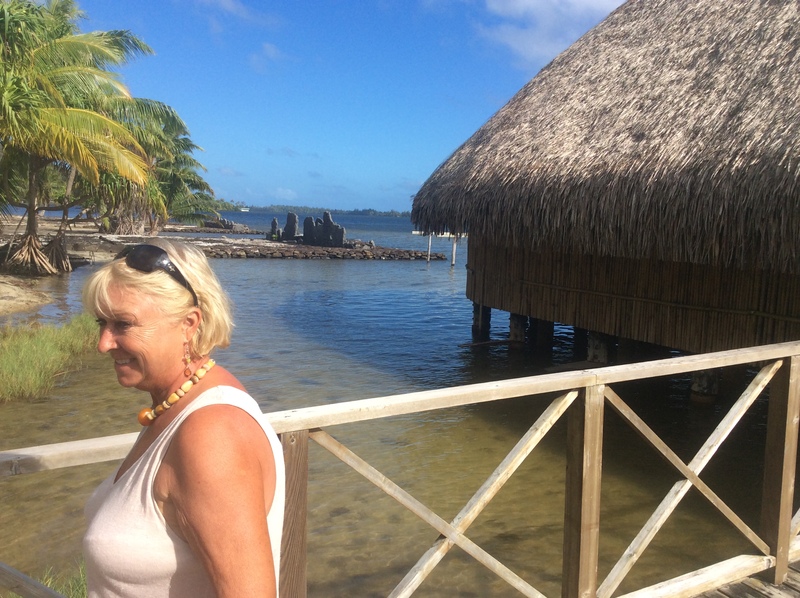 Since we arrived in French Polynesia I’ve been trying to find a location where I could buy black pearls wholesale, not only for myself to make jewellery, but also for friend in Atlanta who also wants them for her business. To date I had not had any luck, the pearl farms we had tried to visit were not open to the public. We stopped for a leisurely, self-indulgent lunch at the elegant but unpretentious, classically Polynesian resort of “Relais Mahana” south of the island. We took a quiet table under the shade of the restaurants canopy on the white sand beach. I kicked off my shoes and dug my feet into the cool, powder soft sand. We ordered rose wine and fresh salad with “poisson cru”, a local dish of raw fish in coconut milk. As I sipped my wine and gazed out over the aqua blue water wiggling my toes in the sand I couldn’t help but wonder “did I turn the gas off? This article was posted in In The Pacific, Uncategorized. Bookmark the permalink. Follow comments with the RSS feed for this post.Trackbacks are closed, but you can Post a Comment.